Nibs come in various shapes and sizes, but the general shape most people are familiar with was originally known as the “slip pen.” This is the individual pen that slips into a holder. This is the shape we’re all familiar with. But the dip pen did not always take this form. The earliest known steel pens for which we have a description, instead seemed to take a form known as a barrel pen. A barrel pen looks like someone stuck a slip pen onto a longer tube of metal. Like these modern versions made in the early 20th-century. You can see that these came with their own wooden holder, onto which you slipped the whole pen. What may not be quite as obvious is that these are one solid piece of steel. It is easily understandable that this shape would be an early one. It’s essentially the bottom end of a quill, which is essentially a tube with a writing end cut into the bottom. Interestingly enough, the first slip pens we know of were actually individual pens cut from a whole quill. This basically allowed you to get multiple pen points from a single quill, and if they could be pre-cut, then when that point wore out, you could replace it with a new one. This became the model of steel pens as well as soon as they moved out of the workshop and began to be cheaply made at an industrial scale. 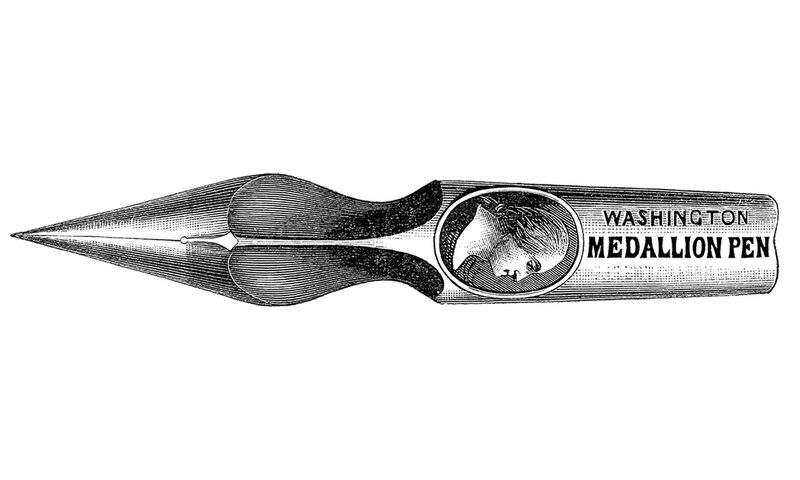 Joseph Bramah was not the first to make these replaceable quill pen points, but he was the most widely known inventor to come up with both a hand press to cut multiple points from a single quills, and a holder to hold them. This picture is found in multiple places on the internet. If anyone wants to claim it, I’m happy to give credit, or take it down if desired. I have found and early reference to a New Yorker, Mr Stansbury, who came up with a way to cut quills into individual “pens” that were held in a holder. This reference was dated to five years before Bramah files his patent. In a letter to Thomas Jefferson from his friend Charles Willson Peale, dated 22 July 1804, Peale mentions that “I have fortunately found an ingenious invention of Mr. Stansbury Junr. of New York for making several pens of a single quill…” Peale suggests Jefferson try out this quill points in his polygraph, as soon as Peale can make some brass tubes (holders) for the quills that will fit the machine in question. The steel pens that were being made around this time, though, were still barrel pens. One of the earliest steel pen makers was a man named Samuel Harrison. He was a maker of split rings (think of those key rings made of a single ribbon of steel wrapped into a circle overlapping itself) in Birmingham, England. He also made pens for his friend, and famous chemist, Joseph Priestly. These early metal pens were made by bending a sheet of thin steel into a tube, and then cutting away the metal to form a nib. Harrison used the seam where the two ends came together as the slit in the pen. Another early maker, Daniel Fellow, a blacksmith from Sedgley, began making pens in the 1780’s. His technique was similar, but he created the split with chisels. Notice the ad says that the pen is “properly mounted.” This means that the pens came pre-mounted on a holder, as were some in the early days. These were still luxury items, so I’m sure the holders were very nicely made, but were still a small portion of the total cost of the pen. These barrel pens were also made in the US in these early days. The first professional steel pen maker in the US was Peregrine Williamson, starting in about 1806 in Baltimore. His pens were very popular at the time, and attracted the attention of President Thomas Jefferson, who became a customer. His pens were also barrel pens. He sold them loose, with a holder, or “properly” mounted. He sold some of the loose nibs to Thomas Jefferson for use in his “polygraph” mentioned above, and also some mounted in a fancy pen/pencil combo complete with perpetual calendar at one end. Here’s the only image we have of his pens. It’s from a newspaper ad in 1809. Notice the similarity in shape to the modern barrel pens shown above. Early slip pens were invented in Birmingham in the 1820’s-30’s as the industrial production of steel pens began to be figured out. They require less work, and less material when good steel was still relatively expensive. Gold pens were made as slip pens, but because they are also more prone to bending and other damage, you often see them mounted in a brass, gilt or other tube which fits onto the end of a holder, in the same manner as the barrel pens. This is a Dawson, Warren & Hyde pen from the 1850’s. You can see the wooden holder has a brass cap that receives the end of the tube into which the gold pen is inserted. The gold wash on the tube was very thin and has mostly rubbed off. This gold pen, made by Piquette in Detroit also in the late 1840’s to 1850’s, is also mounted in a tube which would have fit on a holder like the pen above. Unfortunately, as is often the case, the holder is missing. The barrel pen continued to be made into the 20th-century, almost exclusively by the British manufacturers. They were not very common, or widely made, but they can still be found now and again. They remind us of the very earliest days of steel pens and what they once looked like.